Imagine tearing your knee to pieces. Now imagine playing over a full season of rugby on it. 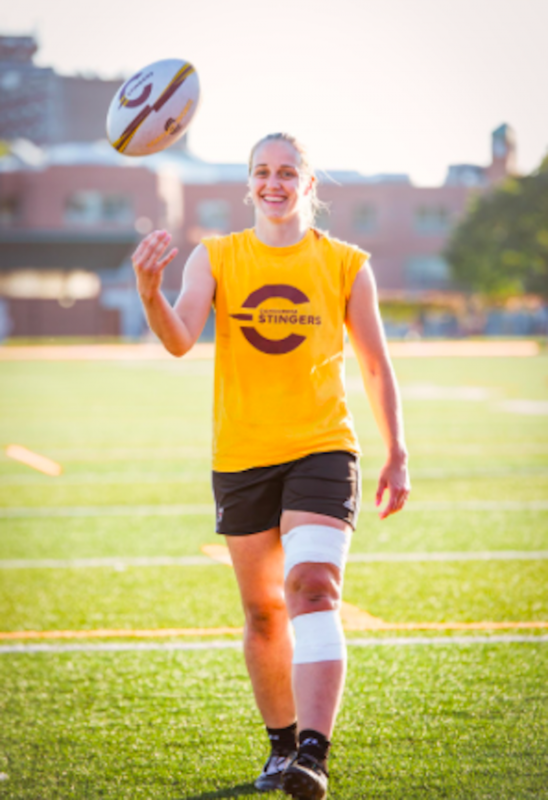 Stingers Women’s rugby all-star forward Jenna Thompson fights for her team during games with a strong heart and injured knee. In the summer of 2016, Thompson returned to the field after her six-month long recovery from shoulder surgery. On her very first play since returning to action, she tore her anterior cruciate ligament. “I went straight into contact with it, and it tore,” said Thompson. The ACL is the ligament that keeps a knee and leg bones in place while doing mundane activities like walking or running. When the it’s injured, it can tear and eliminate the support of the knee, making it very loose and unstable. The moment she tore it, Thompson said she felt very sore. Although over the following weeks, the soreness became more bearable for her. Soon after suffering the injury, she would partially dislocate her knee a couple times during a game, and had to sit out for 30 seconds until the pain subdued. “Now that happens less and less,” she said. Thompson said her injury doesn’t have any impact on her game performance. “It’s just something that I’m living with, it’s natural,” Thompson said, smiling. 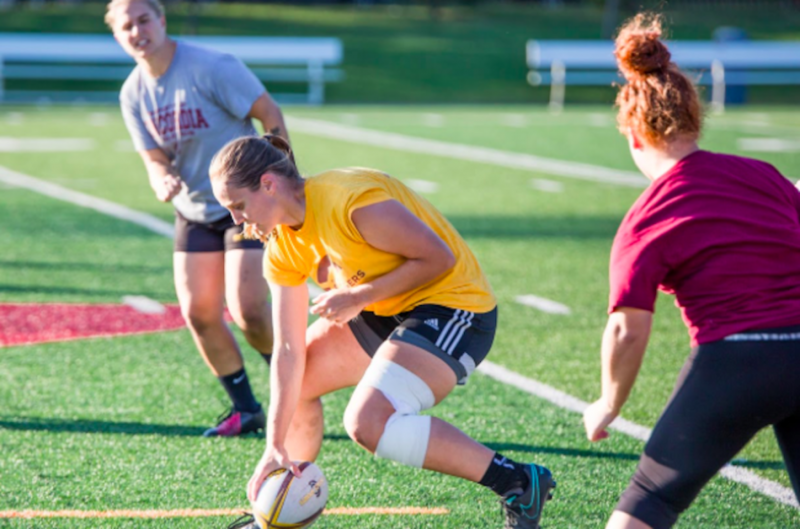 As soon as Thompson figured out her injury couldn’t restrain her from doing what she loves, she decided to keep playing the contact sport, and see how far she can last by simply taping up her knee. “[Surgeons, doctors and physiotherapists] said the best thing for it is to keep working through it,” Thompson explained. To treat the injury, the medical staff figured out a specific taping method that seemed to work wonders for her. She became considerably more comfortable and at ease on the field. However, during practices and games, Thompson found herself to be limited in certain movements. Through trial and error, she realized some variation of moves are tougher on her than others. She tries to avoid them in order to avoid the pain in her knee. “I notice it while I’m taping it or if I go into a certain situation on the field,” Said Thompson. Stingers head coach Graeme McGravie wants the best for Thompson. Over the years, he observed Thompson as a player who gets stronger the more she plays, with or without an injury. “I don’t think this affects her very much at all,” he said. As for the physical therapy, there isn’t much else they can do other than taping it up for her when she plays. The damage is done and her body accommodates for it, the only way it’s affecting her body is the restriction in type of movements. Other than that, the only thing left to do is get surgery to repair it. Thompson planned to get surgery in November 2016, at the end of last year’s rugby season. She felt uncertain about the odds and ends of the medical treatment during the healing process. For that reason, she postponed the surgery and decided to live with her torn ACL. Thompson is open to the idea of eventually getting the surgery. She has experience recovering from surgeries before, and is confident she’ll be able to do it again. “I went though the recovery with my shoulder, I know how hard it is and obviously that held me back from getting the surgery, but I’m no stranger to it,” Thompson explained. Thompson is aware of the long term damage this could have on her knee. Many surgeons and doctors told her she’s at risk of having bad arthritis later in life. “The surgeon told me my chances of tearing my other ACL increases by 15 per cent,” she said. The support Thompson gets from her teammates and her coach really helps her keep her head up and continue playing games with full confidence. Frédérique Rajotte, Thompson’s close teammate for the past three seasons finds her to be inspirational. Her only advice for Thompson is to keep doing what she’s doing and keep eating what she’s eating. “It seems to be like a miraculous type of diet,” said Rajotte, laughing.